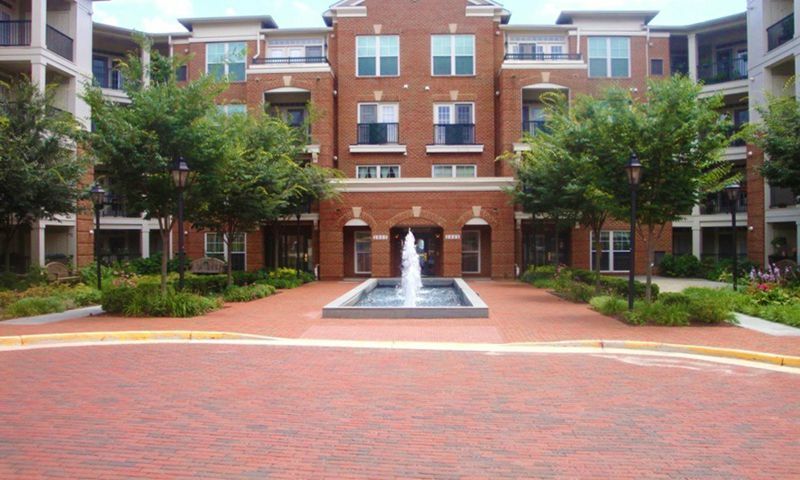 Saintsbury Plaza is a 55+ condo community in Fairfax, Virginia. This active adult neighborhood provides an intimate setting with just 111 condo units that allow neighbors to become fast friends. Charming amenities within this vibrant community also provide plenty of opportunities for residents to stay active and social any day of the week. Homeowners also have easy access to major roadways, public transportation, and daily conveniences. Residents can stay as active and social as they please in this age-restricted community. Amenities are located in the main building and provide areas like a club room where neighbors get together for fun activities. Staying in shape is easy with an exercise room on-site. Homeowners can challenge each other to a friendly game in the card room. They can also prepare a snack in the catering kitchen to take to a club event in the meeting room. The library is perfect for a quiet space to catch up on the latest novel. Concierge services are also offered in the community for residents to use. Active adults can enjoy the neighborhood's natural space by sitting in the outdoor patio or taking scenic strolls along the walking and biking trails. Saintsbury Plaza was developed by Porten Homes between 2005 to 2006. These four-story condo buildings have elevator access and consist of 111 units that range in size from approximately 1,125 to 1,752 square feet. Condo units have two or three bedrooms, two or two-and-a-half bathrooms, and a one-car garage or assigned carport. Some features include large eat-in kitchens, separate dining rooms, dens, granite countertops, tile bathrooms, crown molding, high ceilings, and private balconies. Homeowners enjoy a fun and social atmosphere in this vibrant 55+ community. They can attend events like Friday night happy hour, holiday parties, Halloween parades, Oktoberfest, and other social events. Neighbors can also gather for cards and games in the common room. Making friends is easy with other like-minded adults in this close-knit environment. Located in Fairfax County, Virginia, residents of Saintsbury Plaza are close to everything they could want or need. Just outside of the community homeowners have access to major roadways like Interstate 66 and Routes 29 and 50 as well as public transportation like the Vienna/Fairfax GMU Subway Station. The Pam Am Shopping Center is three minutes away and offers plenty of options like Michael's, Starbucks, Safeway, Walgreens, CVS Pharmacy, Domino's Pizza, a gas station, and banks. There are several parks nearby that are perfect for outdoor enthusiasts. Golfers are also close to a few courses in the area such as the Army Navy Country Club and Oak Marr Golf Complex. Washington D.C. can be reached in about 30 minutes and offers an assortment of cultural attractions, historical landmarks, museums, and recreation. Active adults will love Saintsbury Plaza's charming amenities as well as its close proximity to the Washington D.C. metro area. There are plenty of activities available in Saintsbury Plaza. Here is a sample of some of the clubs, activities and classes offered here. Saintsbury Plaza was developed by Porten Homes between 2005 to 2006. These four-story condo buildings have a total of 111 units that range in size from approximately 1,125 to 1,752 square feet. Condo units have two or three bedrooms, two or two-and-a-half bathrooms, and a one-car garage or assigned carport. Some features include large eat-in kitchens, separate dining rooms, granite countertops, tile bathrooms, crown molding, high ceilings, and private balconies. Please Note: Floor plans are not available at this time. 55places.com is not affiliated with the developer(s) or homeowners association of Saintsbury Plaza. The information you submit is distributed to a 55places.com Partner Agent, who is a licensed real estate agent. The information regarding Saintsbury Plaza has not been verified or approved by the developer or homeowners association. Please verify all information prior to purchasing. 55places.com is not responsible for any errors regarding the information displayed on this website.